Forests and climate change: a convenient truth? ‘Forests and climate change: a convenient truth?’ was the title of a conference I attended on Wednesday, organised by the Forestry Commission. 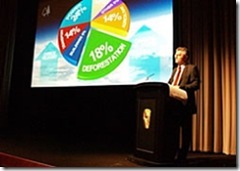 It was a chance to hear from some of the UK’s leading experts on the role of forests and woodlands in tackling climate change, chaired by the king of the "Swingometer", Peter Snow, who lead the interactive electronic voting between speakers. Globally, forest ecosystems play a key role in addressing climate change by absorbing CO2 from the atmosphere and storing it in growing vegetation and soil. Deforestation caused by unsustainable harvesting of timber and the conversion of forests to other land-uses currently leads to 18% of global emissions of CO2 into the atmosphere. But, managed sustainably so that any logged trees are replaced again, forests and woodlands are a good source of wood – an alternative and less polluting energy source to fossil fuels, and a low-energy construction material. The conference was kicked off by the Minister for the Environment, Phil Woolas, who emphasised the importance of including forestry in climate change policy and investing in reforestation, afforestation and prevention of deforestation through financial incentives. He said that "a key goal of UK policy is to make forestry part of the process in Bali [where negotiations on the United Nations Framework Convention on Climate Change will take place next month]. After intensive lobbying of key countries across the world, we now expect support from China, Brazil and the US that this should be the case." planning our forests so that they adapt to a changing climate. The UK is a world leader in forest certification – we are the 1st country in the world to have all our public forests (those managed by the Forestry Commission) certified as sustainably managed, and 45% of the UK’s total woodland is now certified under the Forest Stewardship Council (FSC) scheme1. In the last 50 years the UK’s forest area has more than doubled. This is good news amongst all the doom and gloom we usually hear. However, globally the forest area is falling. Protecting and conserving forests is more of a problem in many developing countries where they depend on the income that is generated from selling timber to developed countries, through both illegal and legal logging and problems with land tenure policies, poverty, population growth, cattle ranching, road building and governance failure. Finding ways to compensate the countries that provide a global service of public goods will encourage conservation. Paul Ekins of the University of London pointed out that there are proposals to introduce carbon credits for reduced deforestation post-2012. 1 hectare of tropical forest can provide $2-2,000 net value from clearance followed by plantation, whereas carbon credits could increase the value of that hectare to $10,000, preventing destruction of the natural forest (based on credits of $20 per tonne CO2 and 500 tonnes CO2 stored per hectare). Stewart Maginnis, Head of the Forest Conservation Programme at IUCN pointed out the need for multiple-use forests that can satisfy a broad range of goods and services, thereby increasing the worth of the forest to multiple stakeholders. It was recognised at the conference that a large proportion of the general public perceive wood burning for fuel as bad for climate change due to the emphasis in the media on the negative effects of forest burning which results in huge releases of carbon into the atmosphere. However, if the wood that is harvested for fuel is produced sustainably and those trees are replaced, wood can be a very environmentally friendly source of energy. Keith Richards, Managing Director of TVEnergy highlighted the fact that the Austrians have caught on to this and developed 200 district heating plants fueled by wood biomass – enough to provide heat for more than 100 municipalities. 14% of the total energy consumption in Austria is from biomass – so it’s clear that it is possible. In the UK however, the amount of renewable energy supplied as heat has decreased due to a lack of incentives, a fragmented supply chain, land use competition for agriculture, familiarity and convenience of natural gas and perceived problems with local carbon emissions. Similarly, timber products including building materials are also very carbon friendly if that wood is certified as being produced from sustainably managed forest. Craig White, Chair of Wood for Gold and Director of White Design, provided some of the maths behind this: on average, 1 tonne of timber used in construction of a building requires 640 kilowatt hours of energy (the equivalent of 640 100W lightbulbs being switched on for 10 hours) in the transport and production of that tonne of timber building material, which releases 480kg CO2 into the atmosphere. A tonne of brick can produce 4 times that amount, concrete 5x, glass 6x, steel 24x and aluminium 126x. He pointed out that it is even possible to construct wooden buildings that are carbon negative – i.e. they store more carbon in the wood than is produced during transport and manufacturing of the building! 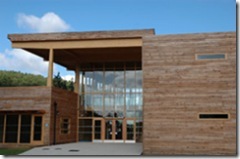 The Dalby Forest Visitor Centre (pictured) is an example of a recently constructed building made almost entirely of wood. It is vital that we adapt our forest planning to include consideration of a changed climate in the future. In the UK mean annual temperatures are expected to rise by 3-6 degrees by the 2080s, summer droughts and winter flooding may become more common and cloud cover in summer could reduce leading to more sunny summers. These predictions, under a high emissions scenario (i.e. if we don’t reduce our CO2 emissions), would lead to a huge reduction in the amount of suitable sites for oak woodland. Changes will vary from one region to another and we’ll have to look carefully at the types of trees we grow. We will need to consider growing non-native species where native species will no longer be commercially viable for timber production. Mark Broadmeadow, Climate Change Programme Manager at the Forestry Commission highlighted the importance of mixed species woodlands as an insurance policy as different species will be affected in different ways. We will need to widen the genetic base through provenance matching, then allow for natural selection. The majority of insect pests that currently affect UK forestry are likely to benefit from climate change through increased summer activity and reduced winter mortality, and pest and disease problems are likely to be complicated by the introduction of non-native tree species. The Right Trees for a Changing Climate website "helps you decide what trees are suitable to plant in London and other urban areas in face of a changing climate". Tim Rollinson closed the conference by quoting from the IPCC 4th Assessment which was released on 17 November which states that the potential of forestry in mitigating climate change has not been fully recognised and that sustainable forest management will have a large, sustainable mitigating effect. Freer-Smith, P.H. ; Broadmeadow, M. S. J.; Lynch, J. M. (eds) (2007) Forestry and Climate Change, 260 pp. 1 Forestry Commission, UK (2007) Forestry facts & figures 2007: a summary of statistics about woodland and forestry, 12 pp. It is still disappointing to see how little understanding there is by civic authorities about using wood biomass which can reduce the pressure on landfills and provide some energy benefits as well.